You are currently browsing the MSBLOG weblog archives for October, 2006. – The removal from the PSM menu of the Show my location feature. – An SMS Phone Book added to the dashboard for quick mobile texting. – Report abuse option in the Help menu. This build will also be pushed down as an auto-update tomorrow. >> Download Windows Live Messenger 8.1 Public Beta in the following languages: English, Spanish, Dutch, French, German, Portuguese, Brazilian Portuguese, Italian, Russian, Polish, Finnish, Hungarian, Turkish, Slovak, Danish, Swedish, Norwegian, Japanese, Hebrew, Greek, Korean, Arabic, Chinese (simplified). Windows Media Player 11 for Windows XP offers great new ways to store and enjoy all your music, video, pictures, and recorded TV. Play it, view it, and sync it to a portable device for enjoying on the go or even share with devices around your homeâ€”all from one place. Windows Vista and Office 2007 will be available through MSDN Subscriber downloads within 7 days of release to manufacture (RTM). MSDN Subscriptions is committed to making new content available to our subscribers as soon as is practical. Very sorry for the downtime over the last day or so – basically we’re too popular and too many people visit us and it maxed out our bandwidth. Or quite possibly, I’m putting images in most of my blog entries and that’s eating up the bandwidth. A lesson to be learnt by all… so yeh, very sorry for the downtime and we’re back up and running (yay!) so rechurn your RSS feeds, get back into the schedule, we’ll have more stories over the next few days. A little while ago The guys at the Feedback Loop posted about a Microsoft Connect 2.2 Preview. Not sure if it’s me but it seams faster. Great to see this upgrade. The top two browsing programs of net users got a big update this month as Microsoft released Internet Explorer 7 (IE7) and Mozilla unleashed Firefox 2.0. Here we take a quick spin through some of the features to be seen in the new versions. Microsoft’s IE7 program is the beefier of the two browsers with the download package weighing in at 14.8 megabytes (MB). By contrast Firefox is a svelte 5.4MB. However, neither should tax a broadband connection. Differences start to show up once the software is downloaded. Once it is done installing, IE7 demands a re-start before you can use it. Firefox installs without that need. It’s a minor difference and a minor inconvenience for those that choose Internet Explorer. Both take about the same amount of time to install and get started-up but once they are running more subtle differences start to become apparent. At first glance Firefox 2.0 looks more familiar as its main page layout hardly differs from earlier versions. But IE7 does look changed because, for a start, the grey menu bar is hidden. It can be resurrected by hitting the “alt” key but you might be surprised by how much you need to call on it when you can’t find it. With IE7 Microsoft has brought tabs to its browser but both deals with them in slightly different ways. With IE7 a blank tab is always available but with Firefox the new tab only appears, and takes up some screen space, when you open one up. IE7 has a neat feature that lets you see thumbnails of all of the tabs you have open at any one time, letting you leap to the one you need with a click. However, it seems to take a moment longer than Firefox 2.0 to close tabs when you are done with them. Opening up quite a few webpageâ€™s in each browser shows up another quirk. Firefox 2.0 seems to do a better job of using the text that webpageâ€™s use to describe themselves. Often in IE7, the only information you get about a webpage you have open but hidden on the bottom taskbar is “http://” – the rest of the title is obscured. Again, a minor difference and a minor niggle – searching a webpage is still more elegant in Firefox 2.0 than IE7. Calling up the search function in Firefox prompts the appearance of a text box tied to the bottom of the page and typing your search term in that takes you to the first appearance of that word or phrase on the page – provided it is there, of course. In IE searching calls up a floating box in which you have to type your text and then click or hit a key to find the term or phrase. One of the very useful inclusions in Firefox 2.0 is a live spell checker that watches over your metaphorical shoulder as you type text into any field on any webpage. It is possible to add a similar function to IE7 but only via an add-on. It will be interesting to see how many people download and install it. When it comes to RSS – the system that feeds updates of webpageâ€™s to those interested – Firefox 2.0 does a slightly better job of making it easy to subscribe to new feeds. With only a click it was possible to add a feed to popular blog-following sites such as Bloglines to IE7 and Firefox. Firefox and Internet Explorer 7 also benefit from thousands of plug-ins, or add-ons – that can be installed to add more functionality to the browser. These range from RSS readers to Instant Messaging clients, Voice over IP programs, and mini iTunes controls – all accessed from inside the web browser page. Finally, both IE7 and Firefox 2.0 have introduced systems that warn users when they are about to visit a site that is known to be used by phishing gangs. These pages are made to look like that of a bank to trick people into handing over confidential information. Firefox handles this by updating a locally held list of known phishing sites every time you use the browser. Microsoft’s IE7 checks in via the web to make sure a site is safe to visit. In the short tests run by the BBC news website, IE7 occasionally took longer to load a page as it carried out a check to see if it was a phishing site. Despite these minor differences, Firefox 2.0 and IE7 are now broadly comparable – something that could not be said of IE6 and Firefox. But it will be up to users to choose which one best meets their needs. I just saw this promo video of “Longhorn”… WOW… I didn’t know how many cool features that there were going to be that I have not seen yet. Check out that photo gallery and the fact that everything is so shiny and movable (Thier version of Longhorn is even running Halo III). Guess what…? I will be in Redmond, Seattle from the Oct 24th – Nov 6th, 1 week as a tourist and the other week as a business trip. When I received the email about the invitation to attend the meeting, I was excited about it. The event was finalized and now I’m on my way there. What are you expecting to see me blog about? I’ll be in the Redmond/Seattle area. The things you will see me blog about will includes pictures of the interesting things in Redmond/Seattle, things that is related to Windows Vista (ain’t that great? 😉 ) and things which is related to me. FYI, I will be working in Microsoft Redmond for 5 days. I’ll be meeting up with Patrick E soon! Whilst you budding Windows Live Messenger testers are fiddling around with the interim version, 8.1, there’s still another major milestone coming. Once a product has been released, they usually look for how it can be improved for the later version; with Windows XP, before it hit the shelves they realised how it could be improved for the next operating system, being Windows Vista. Even though Messenger 8.1 is to come out before Christmas 2006 (if all goes accordingly), Microsoft are still planning what’s to come in Messenger 9.0 which will be the next major milestone for this core Windows Live service. So… what do you want to go into it? 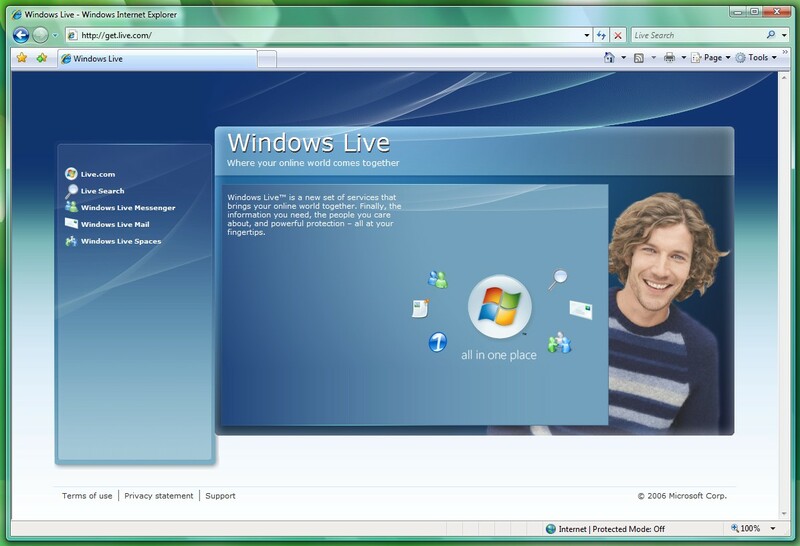 If you use any version of Windows Live Messenger, what could be improved – what doesn’t need to be there – what could be included? 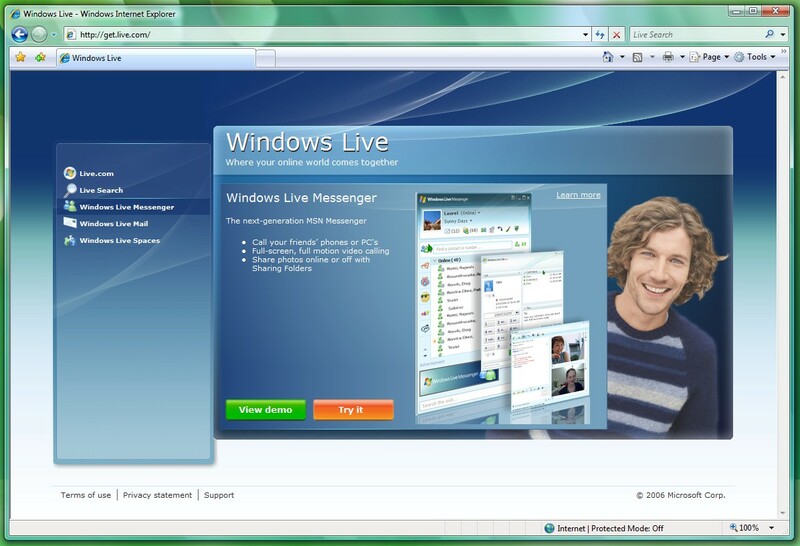 If you’re not a Windows Live Messenger user (maybe you’ve stuck with MSN Messenger 7.5 or use an alternative client), then what would persuade you to jump on the bandwagon for the new version? Finally – I think I speak for the majority of people who actually wanted to get Windows Live (even though I’m partly internal, but for the customer perspective) as now Get Live (http://get.live.com/) is a lot more easier and accessible. Redesigned interface, easier navigation, and all the basic standard Live goodness all in one place. Say goodbye to the times where if you missed the /overview part off a get.live.com URL then you’d get redirected back to Live Ideas, now it’s all swish and beautiful. But lest there is more – it’s not quite finished yet as it’s still being uploaded and tweaked around, but so far so good. Check it out now – or click the images below for a couple of screenshots. Microsoft has started the RTM branch of builds, the single sign pointing to the imminent release of the operating system in the very near future. Today, I will be taking a look at one step along the path to the final release of the operating system: Windows Vista build 5808. Like other reviews of the operating system before this one, I will discuss the changes between the latest public build and the current one under examination. Unlike other reviews, however, I will conduct the review on Enterprise Edition first, with Ultimate Edition possibly coming later. To kick it off, I’ll start with who this edition of Windows Vista is good for. According to Microsoft, it’s not made for small and medium sized businesses. This means that many localized companies might be better off purchasing Business Edition for their main computers and Ultimate Edition for any mobile computers requiring hard drive encryption. The downside to this is that businesses have no choice but to pay for features in Ultimate Edition (Media Center, anyone?) which would be utterly useless in a mission critical mobile computer. Enterprise Edition is designed for companies which may encounter situations where they may need many computers with hard drive encryption or the Subsystem for Unix Applications (SUA) and don’t want to pay for unnecessary features. In other words, it’s basically useless for the end user and there’s no real point in having it. One of the first things which can be seen after inserting the Vista Enterprise DVD is the non-existent EULA and the total lack of a key dialog. The text in place of the EULA simply states that the corporation must follow the terms of its license agreement and that if the person installing it does not fall under a volume license agreement, he cannot install the build. Thankfully, I happen to be covered by a VL, though I do not have access to any means of testing the various volume license methods. This as you can see is the About box for Windows Internet Explorer 7 for Windows XP and Windows Internet Explorer 7 for Windows Vista respectively. As we know, IE7 was released to manufacturing last week and released to the general public, at build number 7.0.5730.11 which means version 7, the 0 is irrelevant, 5730 means how many re-compiles of the software there have been, but as it was based on Internet Explorer 6 SP2, it’s essentially the final build number minus the original one – and the 11 is the sub-build number meaning how many times that build 5730 has been re-compiled. Lovely, glad we got that sorted. Our friends over at the Filing Cabinet Blog (be sure to check out their site)Â have just written a brand new FAQ on Distributed File System Replication (D.F.S.R) for the MicrosoftÂ® Windows ServerÂ 2003Â R2 family. Topics range from interoperability to performance and just about everything in between. For information about DFS namespaces, see the Distributed File System FAQ on the Microsoft Web site (http://go.microsoft.com/fwlink/?LinkID=39465 ).